Then you'll need to cut out 2-3 large stars cut from 2-3 yellow posters (depending on the size of your primary - I'm going with 2 posters for 20 kids) . Cut out ovals in the center, the size of a child's face. You'll also need masking tape or magnets and the song on CD with a CD player. Before primary randomly hang the stars around the room. 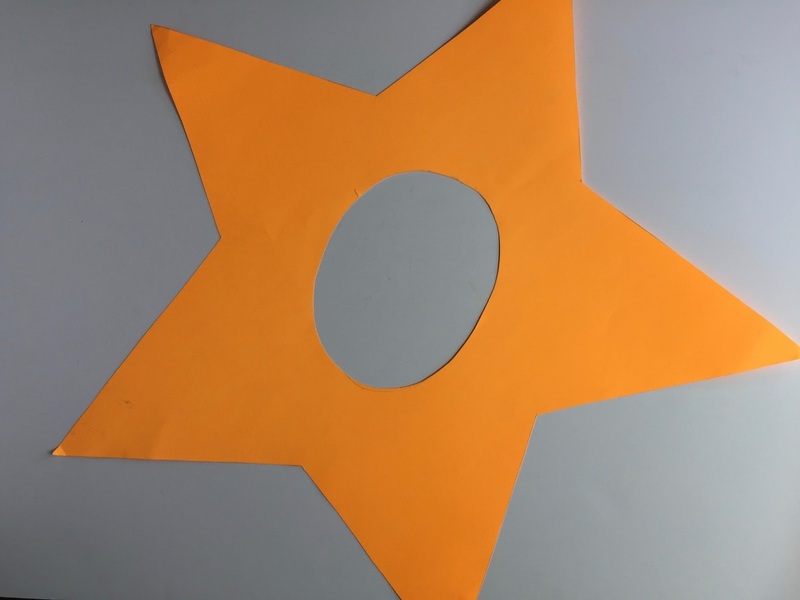 For the activity, have kids put all the star-shaped word cards in order on the chalkboard as we listen to the song on a CD player (iPod or pianist playing with you and the teachers singing would work too). Once all the stars are on the board and in order, I'll have 2 kids come up and hold up the poster stars so their faces are shining through. We, as a Primary will talk about their unique qualities. For example, blonde hair, brown eyes, great smile, sings like a champ, is kind, smart, etc. Afterward, each child will take down a star and we'll sing through both verses. We'll repeat until each child has been "star"lighted (ha) and the stars are all down off the chalkboard. You can use the handbells on the descant portion! Find my bell chart for this song HERE. Find my lesson plan for teaching the chorus HERE. A few months ago I also gave a copy of the music to a boy's mother in our ward for him to learn the obligato part on his violin. As far as I know he's learning it and planning on playing it for our program! If I can, I'm going to see if he'll come and play it for us the last week I am working on this song. Thank-you for posting this!! I AM doing this song, and had no idea how I was going to teach it. Thanks for the great idea. We did a modified version of this today and the kids loved it! She's done quite a few new arrangements for our primary and we're really enjoying them! Thanks for sharing! I'll spread the word.